Former Wexford player Conor Whittle shared his delight with waterfordfc.ie after last night’s 1-0 victory at Ferrycarrig Park. 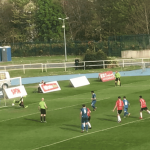 With the game finely poised at the break, Whittle was introduced from the bench for the injured Mark O’Sullivan and within five minutes set up Derek Daly for what turned out to be the winning goal. “We’ve had a tough couple of weeks especially with injuries. When Mark O’Sullivan got injured, I was very surprised to get the call because I thought it would be one of the strikers. “Naturally it’s good to get on the field and also play a part in the winning goal. We’ve got a lot of injuries at the moment and when you look at our bench, it’s basically a lot of our Under 19 team. “I thought that we were poor in the first half if we’re going to be honest but we started brightly in the second half and got the goal. “I thought that the support here tonight was superb. 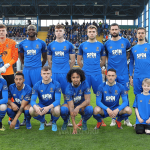 We need the support of the Waterford people and it would be great if that can continue at the RSC next week against Longford Town.